The Syrian situation highlights our curious inability to avoid swinging from one extreme to the opposite. In wondering why, chapter 64 offers some insight. The common adage, “a stitch in time saves nine” says somewhat the same thing with fewer words. D.C. Lau’s translation captures it well too… It is easy to maintain a situation while it is still secure. Interestingly, many common adages convey Taoist points of view as well as, if not more succinctly than, the Tao Te Ching. This speaks nicely to the universal nature of truths common to all. Yet I wonder whether we can truly “save nine“; can we truly stop the pendulum swing, or is this just more wishful thinking? One aspect of this is how such ‘a-stitch-in-time’ advice overlooks the fact that the pendulum process began long, long ago—some 14,000,000,000 years ago. Once swinging, it just keeps going. Curiously, Newton’s First Law of Motion applies here, albeit in a broad fuzzy kind of way: Every object in a state of uniform motion tends to remain in that state of motion unless an external force is applied to it. Naturally, a pendulum isn’t exactly in a state of uniform motion. Instead, it swings ‘left’, then swings ‘right’, ad infinitum in a frictionless vacuum. So, Newton’s Third Law of Motion also applies broadly here: For every action there is an equal and opposite reaction. The tendency of life to get out of hand is deeply disturbing. We want peace, balance, and justice. Yet the pendulum continues to swing, reversing every condition. All we mostly notice are the extremes, whether favorable or otherwise. As chapter 13 puts it, Bestowing favor and disgrace likewise startle; Treasure and trouble likewise seem personal. An ironic side to this is how we either over-do, or under-do life in our effort to settle matters ‘once and for all’. We struggle to either nail down our advantages or escape our shortcomings. 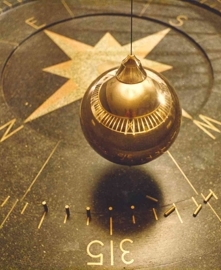 Naturally, that ensures we keep the pendulum swinging, i.e., For every action there is an equal and opposite reaction. Who knows such extremes? It’s not mainstream. Mainstream turns to strange, Good turns to evil. Yes, we have long been confused. That too is how nature, and its biological ways, intends it to be. Chapter 65 supports this, even if a bit obliquely: Of ancients adept in the way, none ever use it to enlighten people, They will use it in order to fool them. Now, what ancient is most adept in the way? For me, that would be Nature and Her biological ways. I like to call this the bio-hoodwink. (1) This ‘both are true’ conundrum is not logical and so can’t be rationally resolved satisfactorily. This is what sets the Tao Te Ching apart from common maxims like “a stitch in time saves nine”. The Tao Te Ching offers ‘both sides’ in one narrative — one short book. Note: The correlations serve essentially the same function; only with them, you create the narrative using your own experiences as source material.